During last night’s episode of Supergirl, the countdown to the Elseworlds crossover officially began. In a stinger scene, the action abruptly cut to Earth-90, home of The Flash from the 1990 TV series. For the first time, fans got to see other superheroes who populated that universe, including Green Arrow, Firestorm, Hawkman and Hawkgirl, as well as Stargirl. Unfortunately, they’re all dead. 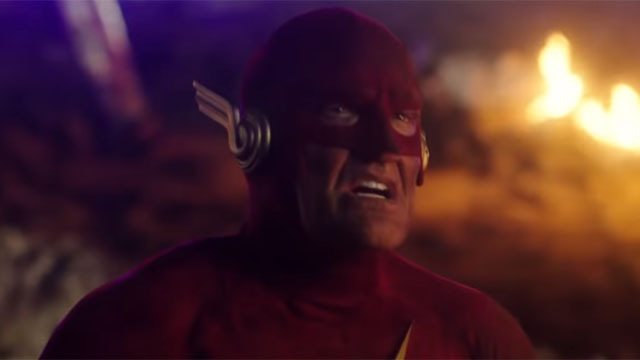 Only John Wesley Shipp’s Flash remains at the end of the world. While the CW promos have set up Jeremy Davies’ Dr. John Deegan as the crossover’s primary villain, this tag scene placed the blame squarely on the Monitor. Despite the Flash’s pleas, the Monitor opened up a mysterious book that unleashed cataclysmic powers. Barry Allen managed to escape, as his ’90s Flash theme song played in the background. However, it illustrates the threat that the Monitor poses to the Arrowverse heroes. Intriguingly, Earth-90’s existence appears to disprove the Arrowverse’s previous contention that there were only 52 Earths, not counting Earth-X. Shipp has been around on the current Flash series since the beginning. Since that time, he has played both Henry Allen (Barry’s father) and Jay Garrick, the original Flash. However, Shipp’s Barry Allen was briefly glimpsed in the second season of The Flash when Grant Gustin’s scarlet speedster brushed up against the multiverse. Elsworlds will begin next Sunday, December 9, with an episode of The Flash. Arrow will continue the story on Monday, December 10. Finally, Supergirl will host the conclusion on Tuesday, December 11. You can watch the Elseworlds teaser scene below. Are you excited to see the ’90s Flash back in action? Let us know in the comment section below!